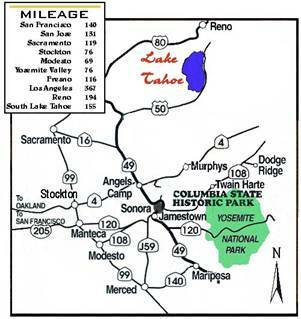 The City of Sonora is located in Central California on the Western slopes of the Sierra Nevada Mountain Range. The City of Sonora serves as the County Seat for Tuolumne County . Highway 49 travels through the Historic District of the City of Sonora and is known as the “Golden Chain” because it connects the historic communities of the California “Gold Rush” and is a favorite of visitors to the area. It also serves as the link from the Sacramento Region to the City. State Highway 120 links Sonora to the San Francisco Bay Area and State Highway 108 connects the community to the Central California Valley. To access Sonora from the Southern California Region the recommended route is State Highway 99 to J59. In addition, there are two non-commercial airports in the County of Tuolumne, Columbia Airport (209) 533-5685 (approximately 5 miles from Sonora) and Pine Mountain Lake Airport, (209) 962-8966. The sun shines on the City of Sonora an average of 328 days per year. Average annual rainfall for the City is 33 inches, January traditionally is the wettest month. The average high for the City is 70ºF with July and August being the hottest months. The average low for the City is 42ºF with December and January being the coldest months. The City’s daytime population increases to 22,000-25,000; this is due to the high number of employees and tourists who enter the City daily. Tuolumne Utilities District 18885 Nugget Blvd. For private utilities such as propane, phone, cable, etc. ; there are several providers within the City, please contact the provider of your choice.